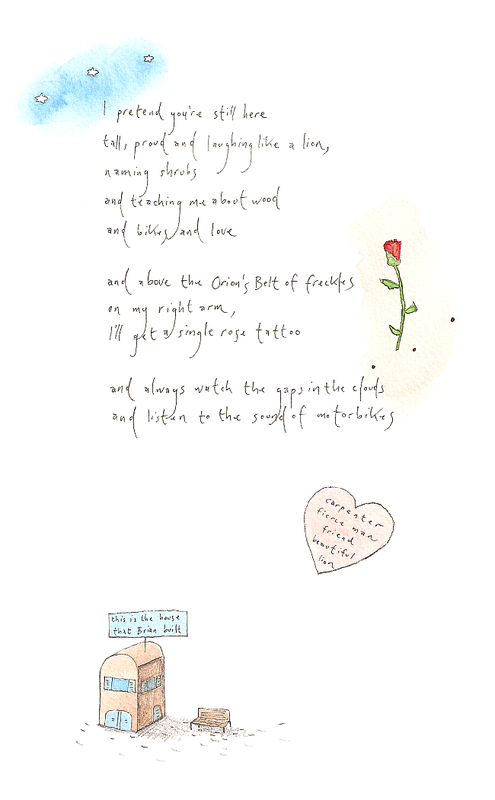 That’s so nicely worded and the illustration is so delicate and sweet. Love it. This is beautiful. Makes me think about how I listen to the sound of float planes. beautiful tribute to a loved one. I am so deeply moved, dear Linda. Joyous at the love that transcends time, weeping at the loss that still wounds, empty at the longing that constantly begs, and hopeful with the thought that you will be with this beautiful lion again. You have left me with such a complexity of emotions. I also like so much the “Deeper than a fairytale …”, so inspiring, beautiful. my thoughts are with you, linda. your poem has left me so deeply touched. Hi Linda. I´ve tagged you and your fabulous poems. magical and lovely. I’m printing this out to keep by my computer to be reminded of the beauty of your words and art. thank you for sharing your art and your emotions. Beautiful words- such a lovely tribute. How wrong can a poem be that ends with the sound of motorbikes ? So I’m biased but this is a great poem, it evokes moments of magic in days of happiness. Hope you will always be able to find phrases like “Orions’s Belt of freckles” with your poetic telescope. Just wanted to drop you a note to tell you that I am thinking of you today and praying for you as well. You are on my heart this morning very heavy. I know that this is a very difficult time for you. It will take time for you and your heart to heal. I know it seems like it’s one thing after the other right now. It can be so very overwhelming just to think or draw or feel. I pray that God will hold you in His loving arms and rock you gently and softly. Have quite rest right now my friend. I miss you so much my friend. I really do. Be well. a beautiful poem and very touching.